Lot Size: 6322sq. ft. 58ft x 109ft "Corner"
Exceptional Fully Developed Silverwood Home! \r\nThis custom built one owner four level split has it all! 2070 sq ft, five bedrooms, den, three bathrooms and loads of upgrades throughout this immaculate property! Spacious entry, hardwood flooring and bay windows in the living room and formal dining room with New York paneling and crown molding. A newer kitchen with lots of shaker cabinets, Granite counter tops, subway tile back splash, pot lighting, pantry with pull-outs, an eating bar and dura ceramic flooring that continues into the dining area with garden door to the deck and open to the large family room with hardwood flooring, upgraded gas fireplace with magnetic doors, the den and a bathroom/laundry room. The upper level has three good sized bedrooms, a newer main bathroom with ceramic tile floors and walls and a soaker tub, the spacious master bedroom has a newer ensuite bathroom with a full size shower. The finished fourth level with cork flooring in the two extra-large bedrooms, two storage rooms and lots of additional storage space. Direct entry to the finished 24 x 24 garage with two new overhead doors in 2015. This well-maintained home has many recent upgrades including, newer triple glazed windows with LowE and solar shield throughout, new 35 year shingles in 2009, new humidifier in 2019, new exposed aggregate driveway in 2014, newer kitchen, bathrooms with Granite and in-floor heat, front exterior door, upgraded hardwood, dura ceramic, laminate and cork flooring throughout. A beautiful mature fully fenced yard with a two tiered deck, stamped concrete patio and a shed with new shingles in 2018. 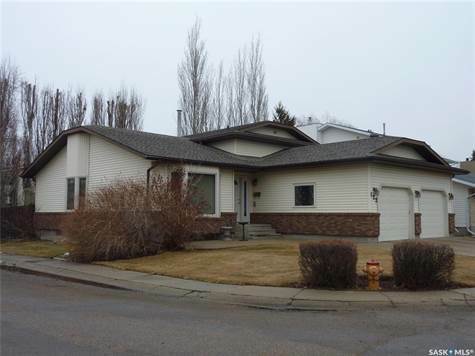 Located on an inside crescent corner lot allowing for yard access. Central air conditioning, central vacuum, underground sprinklers and newer stainless steel appliances. An excellent neighborhood, a half block to the park and Silverwood Golf Course, close to both elementary and high schools and Meewasin Park, overlooking the river!